If your kids are smoothie-lovers like mine, here is a must-try flavor to add to your blender repertoire. 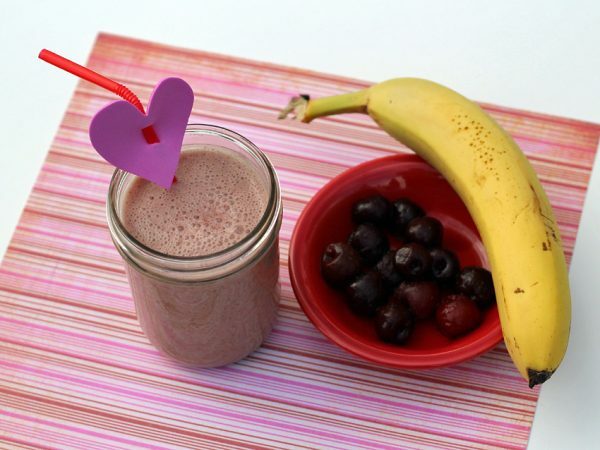 My toddler, tween and teen are all in love with this pretty-in-pink cherry banana smoothie. With just 4 ingredients, this smoothie is simple to prepare, but big on taste. It has a protein-boost from Greek yogurt, and the naturally sweet cherries and banana make this smoothie seem like a decadent treat! This flavor combination is the best. You’ll fall in love with this recipe and want to make it every day. This is a great breakfast idea for Valentine’s Day. 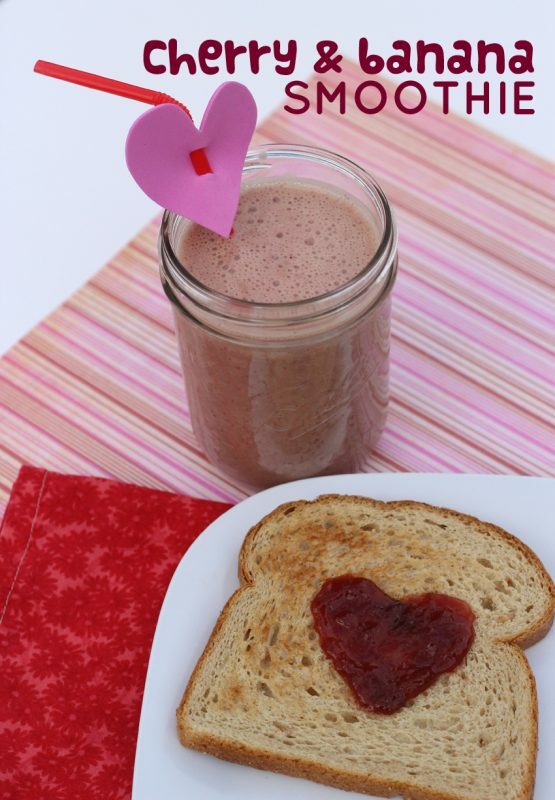 The pink color of the smoothie makes it perfect to make for a loved one on LOVE day! 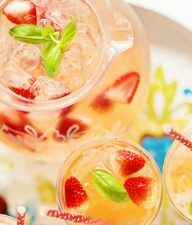 Add a little heart straw to make it extra cute and special. My kids thought this was so fun and cute. If you don’t have frozen bananas on hand, pop some in the freezer overnight. If your blender is not super-powerful, slice the bananas before freezing for easier blending. 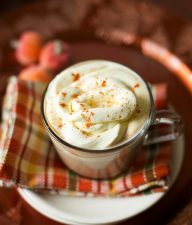 Blend all ingredients until smooth and creamy. Makes 2 generous servings. For a thicker smoothie, reduce the milk to 3/4 cup or add another half of a frozen banana. I don’t find the maple syrup necessary, but sometimes my girls have a craving for something super-sweet. Leftover smoothies make excellent popsicles, too! I have even been known to sneak a handful of spinach into this smoothie – as long as you don’t use too much, the smoothie will keep its pretty pink color. 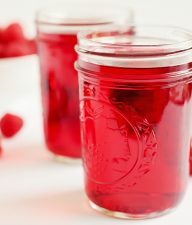 Serve alongside toast with a strawberry jam heart, and Valentine’s Day breakfast is done! Happy Valentine’s Day friends! Blend until smooth and creamy. Makes 2 generous servings. ABC Smoothies for an After-School Snack: a perfect healthy and filling snack for your kiddos! Earth Day Green Smoothies: this smoothie is earth-friendly and SO delicious. Mint Oreo Cookie Smoothie: chocolatey cookie goodness in one cup! 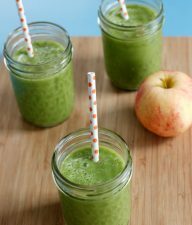 Green Smoothies for the Whole Family: a few different ideas to throw into your green smoothies.